Are you an avid golfer? If you are, you may have considered purchasing your own golf cart. And for good reason, too. There’s no reason to haul all your gear around on your shoulder if you don’t have to! There are many kinds of golf carts to consider, from gas- or electrically-powered riding carts, to carts you push around. Whatever type you go with, your body will thank you. But with so many options to choose from, how do you choose the best golf cart for you? Asking yourself some basic questions, like where you’ll be using your cart most often, can guide you in the right direction. To get you even further, we’ve created this ultimate guide. Ready to learn more? Well, grab your golf clubs and let’s go! We’ve got reviews of all of our favorite golf carts up first. Then you’ll find a benefits section and advice on buying new or used. Plenty of golf carts are available today, which can make your decision difficult. Though your decision will ultimately have to depend on your needs and wants, we’ve compiled a list to get you started. Whether you’re looking for the best electric golf cart or the best gas golf cart, you’re sure to find something that meets your needs. Push carts are definitely worth your consideration, too. Here’s our list of five of the top golf carts on the market today. We have to admit- we’re a little obsessed with this single rider golf cart from Eagle. It’s the perfect size for someone that wants an easier way to get down the fairways without the hassle of the full-sized vehicle. The Eagle is easier to get in and out of, and you can easily access your clubs from the front of the vehicle, and put them away quickly. It’s made with a steel frame and the body is constructed from fiber glass, available in green and red. This golf cart is accompanied by a 12 month warranty from the purchase date, and a 6 month warranty on the battery. The best part? The golf cart folds down easily, and can fit inside of most minivans and SUVs. This slick red ride is coated in a 15-year rust protection, so that you can feel comfortable taking this out for a spin on the course in any weather. All of the smaller pieces that hold this golf cart together are all stainless steel, another great way to make sure this thing lasts. The wheels sit on independent suspension, to better tackle “off road” situations. With a maximum speed of 25, and a nice turn radius, this HDK easily made our best golf cart list. Going out for a golf day with the kids? Then consider a riding cart to keep their energy up! Designed for ages 3 to 7, this battery-powered riding cart is the perfect companion for your parent-child outing. Equipped with a working horn, canopy, and forward and reverse gears, this cart includes several features to keep your child safe while out on the green. For some added fun, this cart comes with a set of balls, a putter, a tee, and a bag! Though we have a larger variety of the best golf carts for pushing and pulling in another article, we still wanted to feature a few here. If you’re looking for electric, then don’t let this golf cart get past your consideration! Though lightweight, this cart definitely gets the job done. Choose from various speeds to match your gait, and quickly fold the frame when you’re finished up. Though this is battery-powered, there’s no need to worry. This lithium-ion battery will last for all 18 holes. If you’re looking for the best electric golf cart, the Big Boy Quad Navigator is the one for you. The remote control feature allows for a full range of motion, and specialized technology keeps the cart headed in the right direction. Enjoy a convenient battery level indicator, as well as the option to run on solar power. If you like gear with lots of features, this may be the golf cart for you. Don’t let its light weight fool you. This cart stands up to the job of carting everything you need for a great day of golf. Easily fold this cart down for easy travel, and move easily thanks to the large ball-bearing wheels. Though light this cart doesn’t skimp on the features. It includes a holder for your drink and scorecard, as well as other items you’ll need while out on the green. Whether you’re looking for a riding golf cart or the push cart, you’ll love having one that’s all your own. For riding carts, both electric and gas are great options. 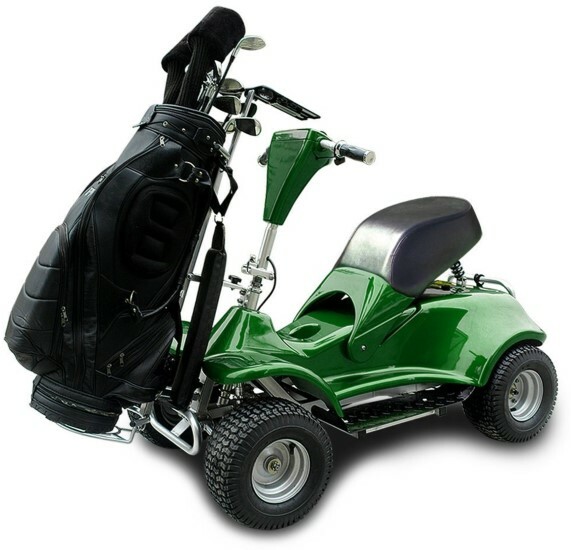 Perfect for a day on the green, riding carts have many uses beyond the course as well. Use your cart for neighborhood transportation or yard work, or to help those with less mobility. Whatever you use your cart for, you’ll be glad you have it. If you’re looking at push carts, you can choose from manual or electric options. These are conveniently available in both low and higher price ranges. Whichever type of cart you choose, you’ll have a convenient method of transporting your golf bag, saving yourself some potential back strain. When choosing the best golf cart, there are many things you should consider. First, make sure you know what your wants and needs are. Then, determine which type of cart you want. From that point, you can start to get down to the details. Are you interested in buying new, or used? If you’re willing to purchase a used cart you will end up saving yourself a lot of cash. Used can be a great option, especially when looking at riding carts, since golf carts can last a long time–several decades, in fact. When looking at used carts, remember to check for proper maintenance that batteries are working and that nothing is wrong with the cart. Don’t be afraid to ask for a test drive. Also, make sure it has the accessories and/or features that you want. If you’re looking at new golf carts, check for a warranty. Research the warranty’s terms so you know exactly what is being offered. With new options, you’ll have the chance to pick and choose which accessories and options you want, so choose a cart that has everything you’re looking for. Unless that cart falls outside your budget! Test drives aren’t only a good idea when buying used. Take any new carts you’re considering out for a spin as well. Who Makes the Best Golf Cart? A lot of golf cart brands are comparable, especially when it comes to the push and pull golf carts. There you’ll want to stick with any cart that has the features and compatibility you need. If you’re looking at investing in a driving golf cart, do your research. A good way to find out who makes the best golf cart is going to be by calling your favorite courses and finding out what brand they use and prefer.